What is BPA? If you are a new parent you may have noticed more “BPA free” labels on packages for baby bottles, sippy cups, or toys and wondered what it was. For some years now there has been a lot of concern about BPA in plastic baby bottles and canned foods. Studies have suggested a link with BPA to both breast and prostate cancer. It’s also been linked to heart disease, diabetes, obesity, behavior problems and reproductive disorders (like miscarriage and birth defects). This chemical is a known endocrine (hormone) disrupter. In other words: BPA is bad stuff. Of course, the food and chemical industries continue to press forward and insist that the science has not proven BPA is a health hazard. Like GMOs, it’s another cruel science experiment where we are the test subjects. Lucky us. BPA is also used to make linings of food cans which forms a protective barrier between the metal of a can and the food. Exposure to BPA is widespread, with detectable levels found in more than 90% of the U.S. population (source). A 2011 study showed that dietary intervention can decrease levels of BPA exposure. 20 participants in five families switched from a canned and packaged food diet to a “fresh food only” diet for three days. Urine levels of BPA metabolites decreased significantly during the fresh foods intervention. A good reminder why real fresh food is so important. Staying away from canned and packaged foods can help decrease your levels of BPA drastically. 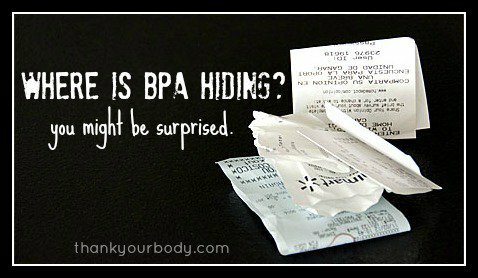 Unfortunately, BPA is lurking in a lot of places these days. In fact, you may be surprised by some of the hidden sources of BPA. It’s very unlikely that you will be able to avoid all BPA in today’s world, but knowing where it is can help you make some simple changes and keep your family’s levels as low as possible. In other words, it’s not just important to ask “What is BPA?” You need to know where it is found. 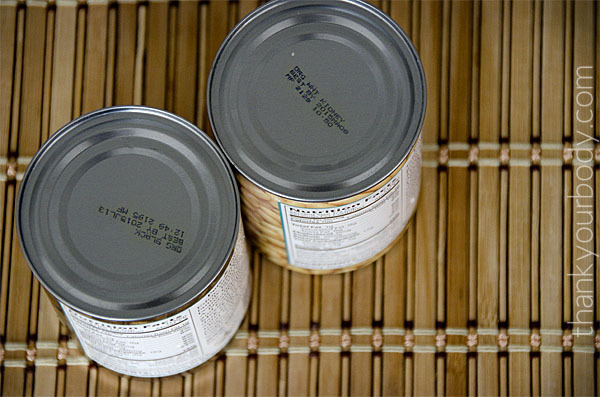 Most canned goods are lined in epoxy resins that contain BPA. The chemical can easily leach into the food. Soup, vegetables, beans, tuna, and fruit all seem particularly likely to have traces of the chemical. What to do about it? Eat fresh food as much as possible. Consider canning your own food (in glass jars) during the harvest months. When canned food must be used, look for BPA-free cans whenever possible. Plastic bottles, containers toys, sippy cups… we are surrounded by plastic. And the BPA found in them can be harmful. Now days there are a lot of “BPA Free” options for many plastic products. But beware, these plastics are often still using other toxic chemicals. What to do about it? Consider more eco-friendly options for your kids like these stainless steel cups or wooden toys. Switch to glass containers. Keep in mind that plastic water bottles are often laced with BPA, too. If plastic is your only option, avoid putting hots foods in these containers, and do not microwave plastic ever. Receipts printed on thermal paper can have traces of BPA, according to a study published last September in the journal “Analytical and Bioanalytical Chemistry.” And thermal printing isn’t just used in receipts. It’s also used for things like movie tickets. What to do about it? 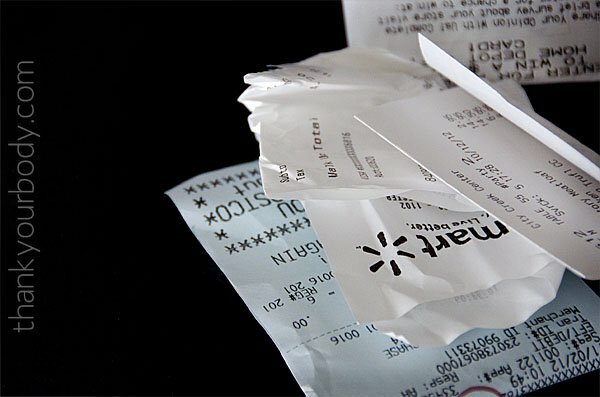 The easiest way to avoid BPA from receipts is to just not take one. If that’s not an option, your best bet is to minimize your contact with the paper and make sure to thoroughly wash your hands before putting your fingers in your mouth or handling food. Children are especially susceptible to BPA since their bodies are still developing. I personally don’t let my child handle receipts, and I always wash my hands as soon as possible after I do. What to do about it? Consider making your own baby food or doing Baby-Led Weaning. It’s a healthier option for your child on a number of levels. The sealants dentists use to protect teeth from cavities break down into BPA when in contact with saliva. That’s the word from scientists at Mount Sinai School of Medicine in New York City. What to do about it? The sealants are considered safe for kids, for whom they’re most popular. And the exposure disappears a few hours after the sealants are applied. But researches at Mount Sinai advise pregnant women to steer clear. I personally would just say “no” and make sure to eat a real foods diet to avoid cavities. A recent study in Denmark indicated that toilet paper might have traces of BPA. Toilet paper is often made from recycled paper, which often contains BPA. What to do about it? This may be one of those instances where you just have to relax and let it be. For the truly diligent you can find some other options, otherwise just be sure not to use toilet paper for anything but what it was designed for. If alcoholic beverages are fermented in BPA lined vats they can become contaminated with the chemical. What to do about it? For my family this is a no-brainer, as we don’t drink. But if you do, consider doing a little research into your options and find wine that hasn’t been fermented in plastic-lined vats. These are the questions that more people need to ask. Sadly, this list doesn’t even cover all the hidden sources of BPA. Our world is full of garbage that our bodies are trying to learn how to deal with. It’s so easy to get overly anxious about all the hidden toxins in our world today. Trust me, I get it. The important thing is to stay informed and continue making progress toward a more healthy life. Baby steps, my friends. Stay the course and you’ll be amazed at how far you can go over time without freaking out. Tell me, what’s your next step toward toxic-free living?